“These dogs have it made,” my husband declared, surveying three shaggy mounds reclining under and around our breakfast table. They could say the same about you, I replied, as I put a prosciutto-lined ramekin of eggs baked with cream on the placemat in front of him. One for B, and one for me. Freshly cut chives glowed grass-green against the yellow yolks. My husband’s a smart man. He just smiled, blessed our breakfast, and dug in. 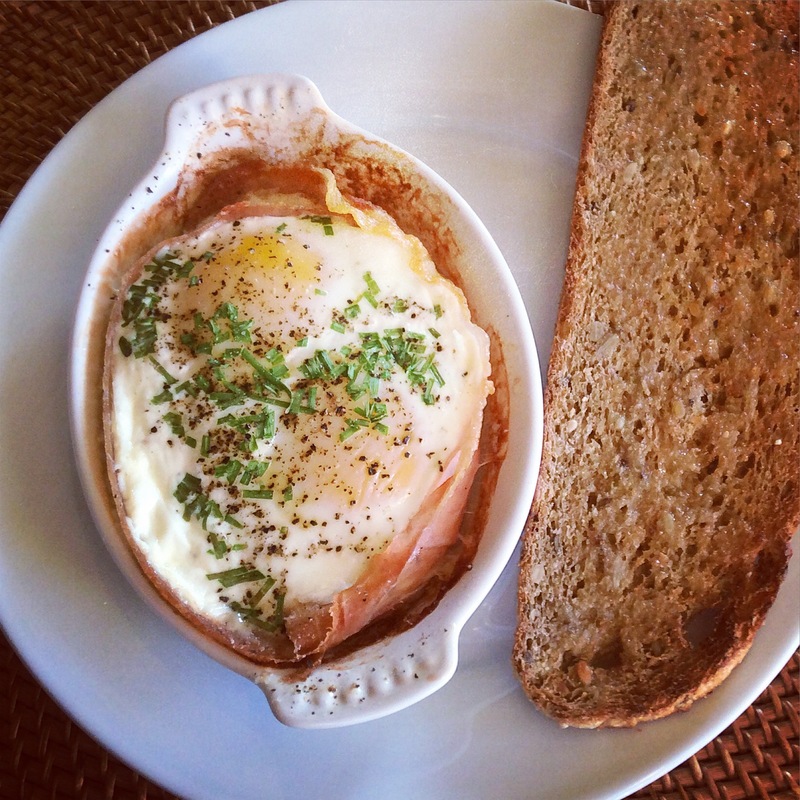 Click here for the recipe I posted in 2013 for baked eggs. To make this version, line the buttered interior of a ramekin with thin slices of prosciutto. Add eggs and cream, grind some pepper over the top, and sprinkle with a few grains of salt. (Prosciutto is very salty already and may supply enough seasoning as is.) Bake at 375F. until the whites are firm and the yolks are wobbly, about 10 minutes. (Jiggle the ramekins towards the end of the baking time to judge doneness, and keep cooking if the eggs are still raw.) Shower with chives before serving for maximum green. Step around the dogs on your way to the table. Simple but charming dish! Breakfast! Indeed, baked eggs are so easy to make, they can be breakfast on a workday. Hope you enjoy some soon!